And what the camera recorded led Bishop to an appearance at Bicester Magistrates’ Court where he was fined £750 and landed with a costs bill of £440. Confronted with the damning footage, Bishop had little choice but to plead guilty to fly-tipping and to a charge of carrying waste without a licence. The film clearly shows Bishop reversing his van up to a set of gates and looking around to check that the coast is clear. Reassured that no-one was watching – and obviously oblivious to the concealed camera – he then unloaded a variety of builders’ waste into a lane near the village of Chesterton, just outside Bicester. Steve Vicary, the council’s environment enforcement officer, remained tight-lipped about the use of hidden surveillance cameras. But it has previously been reported that Oxfordshire County Council has deployed spy cameras that are similar to those used by MI5. 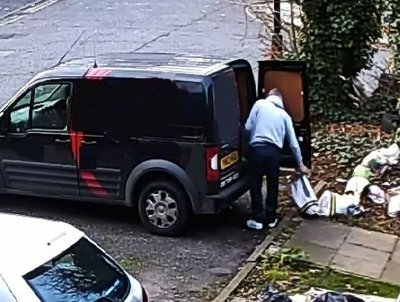 And it’s been reported that other UK councils have used cameras hidden in soft drink cans and even cigarette packets to catch out fly tippers. Fly-tippers sent to prison for dumping asbestos near school.